Losing weight while traveling can be easily accomplished with the right strategies, and most importantly, hard work and discipline. Research has shown that frequent travelers have a higher body mass index, higher blood pressure and are generally in worse shape than light travelers. So while you're enjoying the jet set lifestyle, you might be doing some serious damage to your body and your physical appearance. Frequent business travelers cite a lack of time and motivation to exercise as the number one reason they skip workouts. Combine this with a poor diet and increased alcohol intake and you have a disaster in the making. Considering all this, it may seem impossible to lose weight while traveling for work. But by maintaining just a basic fitness routine while you travel and making smarter food choices, it can be done. Our instinct when we want to lose weight is to start logging miles on the treadmill. Everyone thinks that cardio is king for fat loss. It has its place, of course, but is not the only form of training that should in your fitness routine. The research has been pretty decisive: high intensity interval training and weight training are superior to cardio when it comes to one thing in particular. That's Excess Post-Exercise Oxygen Consumption, or EPOC. This is your body using oxygen to return to its normal metabolic rate after a strenuous workout. And more oxygen used means more calories burned. The other thing is how important resistance training is for improving your body composition. It's simple. More muscle equals less fat. Don't worry, you're not going to end up looking like a bodybuilder from this. You'd need a ton of other things to achieve that and if that's what you're looking for, you're in the wrong place. Using external resistance, from weights, machines, or your own bodyweight, is critical for several things. It helps to prevent the natural loss of muscle that comes with aging, it protects bone health, and increases your resting metabolism even more than traditional cardio. Don't be afraid to include strength training in your fitness routine. It can be as simple as bodyweight exercises, like push-ups and air squats. Strengthen your muscles and watch how your body composition improves. You can still do your cardio but just remember that a more complete approach to fitness includes multiple forms of training. Most people aren't using the hotel gym, no matter how nice it is. A recent survey showed that only 22 percent of hotel guests actually used the fitness center, even though nearly half said they planned to use it when they arrived. From an investment perspective, hotels are losing money on their fancy gyms. That hasn't stopped them from building fitness centers with gorgeous views and increasing workout options, though. Many hotel gyms have a lot more than treadmills and dumbbells now. It's common to find a hotel fitness center fully equipped with heavy weights, including barbells and squat racks, as well as functional fitness equipment like kettlebells, gymnastics rings, and battle ropes. Use the damn hotel gym. If you have any say in the hotel you stay at, be sure to choose one with a decent gym. Use it. Commit to working out in the hotel gym at least every other day. You don't have to spend two hours in the gym. Twenty minutes to a half hour is more than enough, as long as you’re putting in maximum effort and keeping the intensity up. This can best be accomplished with high intensity interval training (HIIT), metabolic conditioning workouts, and bodyweight exercise training. If you want to burn some serious belly fat, check out these five ab workouts that you can do in any hotel gym. Now, one thing we know is that you can count on most hotel gyms having dumbbells. They might not be that heavy, but that’s fine. When trying to lose weight, dumbbells are your friend. There are light dumbbell-only workouts that you can do that will incinerate body fat, improve your conditioning, and help build some muscle. My personal favorite is called “Hotel Hell” and it’s intense. Start with 5 burpees. Then complete as many dumbbell thrusters as possible until the minute is up. Repeat until 100 total thrusters are completed. Want to know more about losing weight while traveling? Get your copy of Fit For Travel! If you have a gym in your hotel, that's great. If it's actually decent, and by decent I mean more than just a treadmill, that's even better. The reality is that you can't always count on having this available to you. Plus, you might not feel like going to the hotel gym. Great workouts do not require any equipment. Always have a backup plan for working out while traveling. The hotel may not have a gym or it could be closed for renovations. By being prepared with go-to bodyweight workouts, there's no travel-related workout obstacle you won't be ready for. The great thing about bodyweight exercises, aside from the fact that they're awesome and incredibly effective, is that you can do them in your hotel room. Or you can do them outside. Or anywhere. Keep workouts short and minimal. Maximize your time by performing high-intensity bodyweight circuits right in your hotel room. This will allow you to build muscle, burn more calories and get better results in less time. Bodyweight exercises require no machinery or equipment and are a simple, effective way to develop your strength, stability and flexibility. TRXTraining.com - TRX Suspension Training Equipment and Athletic Gear! There's no way around it - high intensity interval training (HIIT) is one of the greatest and most time-efficient ways to lose weight. It may also be a traveler's best exercise strategy due to its lack of reliance on machines and equipment. It's simple - short periods of all-out work followed by short periods of rest. 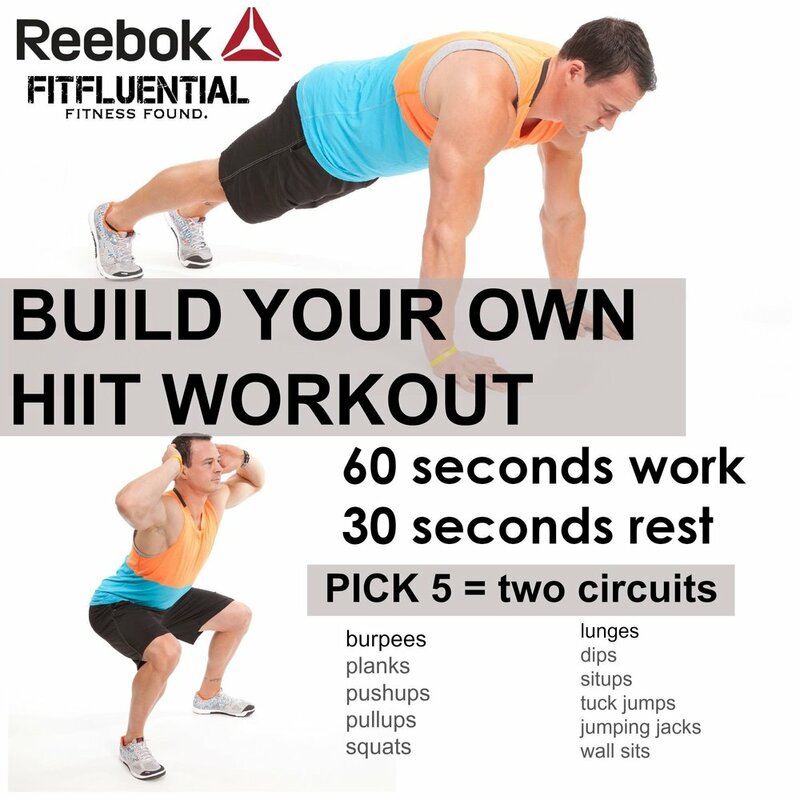 Here's an example of how to build your own HIIT workout. Remember, exercises like push-ups, squats and burpees can be done anywhere, but pull-ups may require some creativity. You can usually find a decent pull-up bar in most hotel gyms, parks, and near many beaches. Strong tree limbs work too. If you can't find anything to do a pull-up on, try doing some one-arm rows with your suitcase or bag. Unlike a slow run with a target distance measured in miles, sprinting shorter distances at a higher intensity will help you build muscle. This means even more fat burned if you're trying to lose weight. Perhaps best of all, it can be done in less time than running for distance or jumping on the elliptical. Find a spot where you can run sprints up to 50 yards in one direction. Grass, hills, the beach, or a track work best. If you have to, you can use a treadmill. Perform a quick warm-up and then set a timer. Run sprints for the entirety of the time established; 10 to 20 minutes being ideal. Start with about 50% intensity and gradually increase until you are sprinting at 95%. Bring it back down to 60% for the last few sprints. Rest only in the time it takes you to walk back to your starting point. There are a ton of strategies out there for you to choose from these days but it can be tough to figure out which will work best for someone who spends a lot of time traveling. We chose three weight-loss strategies that are perfect for travelers and will trigger immediate weight loss, improve long-term body composition and protect you from many preventable health risks. This is a tough one but if you are dedicated enough to stick with it, the benefits of the Ketogenic Diet go far beyond losing weight. Let's consider some of these benefits. Want to lose fat, improve your cognitive functioning, and even starve cancer cells? The Keto Diet is a great way to improve your whole body's operating system, lose weight, feel better and perform better physically and mentally. Ketosis is the act of shifting the body's primary fuel source from glucose to ketones (or fat) and helps accelerate fat burning and fuels metabolism. Ketones are molecules formed by the breakdown of stored fat. The human body stores carbohydrate glycogen in addition to that fat and when they are depleted, the body begins to burn the fat stores for energy. To trigger this state of ketosis, you have to eliminate all foods that are not meat or vegetables. That means no sugar, bread, pasta, potatoes or rice. Reduce your carb intake gradually at first until you have eliminated them almost entirely. Learn more about the keto diet here. This might be the best weight loss strategy for travelers for two reasons. The first is that its simplicity makes it easy for anyone to give it a try. The second is that its basic component is not eating for an extended period of time, which is perfect for someone who is busy with a hectic travel schedule. For example, you may already intermittently fast between your last meal at night and your first one the next day. The time between those meals is your fasting period. Now consider extending that window to make it more effective for fat burning. If you skip breakfast and maybe even lunch the next day, you can now extend your fat burning window to 16 or even 24 hours. This length of time is considered optimal for intermittent fasting. As with the Ketogenic Diet, the benefits of intermittent fasting go far beyond fat loss. With no blood sugar spikes and crashes, many intermittent fasters report feeling sharper mentally at work. Many common cancers are associated with high sugar environments and could potentially thrive from diets high in sugars and simple carbohydrates. By depriving cancer cells of this glycogen, some doctors and scientists believe that a fasted or ketogenic state could be more effective at preventing or fighting cancer than any alternative currently available. Learn more about intermittent fasting here. Many nutrition experts are now embracing the 90/10 rule for eating. This means that 90 percent of the time, you are eating healthy and the other 10 percent of the time you can eat your cheat foods. This strategy is good all the time but is perfect for traveling. Who wants to go on vacation and not enjoy some of their favorite foods? The 90/10 rule allows you to indulge some of the time. What business traveler has access to healthy natural foods all the time on the road? The 90/10 rule gives them some flexibility in choosing some less healthy snacks on the go or being less picky when dining with clients. The importance of a few cheat meals is not just limited to providing travelers with diet flexibility. Psychologically, it would be almost impossible to stick to a strict diet all the time while traveling. Assuming you eat 5 smaller meals a day, stick to your healthy diet for 30 meals a week and let yourself enjoy some of the food you love for the other 5 meals. Those cheat meals will be your reward for eating right most of the time and will allow you to relax your mind a bit. Physically, you cannot keep your energy levels up if you are always in a caloric deficit, which tends to happen when constantly eating clean. Help your body regulate body weight and fat mass by occasionally indulging in higher calorie meals. As with any weight loss strategy, consult your physician before starting and include exercise to maintain your highest level of health. If you're going to get serious about dropping body fat, you need to address your liquid calorie intake. Cut out all of the beverages that contain high amounts of sugar, which is damn near everything that's out there. No more orange juice, no more French Vanilla creamer in your coffee, and no more Gatorade (yes I said it again because for some reason many people think Gatorade is good for you). If you're looking for ideas on how to get through your day without all of the drinks you're used to, here's what I drink on a regular day: black coffee in the morning and afternoon and water all day. Put some lemon or lime in your water to give it some taste if that helps. And no more beer. Try a glass of wine or whiskey (no mixers), or vodka and club soda once or twice a week. That's it. Reaching your health and fitness goals should be a road that doesn't end until your final days on this planet. Changing your eating habits or adopting a workout routine should not end when a goal is met. Your goals should be nothing more than checkpoints along your lifelong journey to achieving a healthy and fit lifestyle. Commit to a lifestyle change that never ends. Invest in your future health with just a few minutes each day now and think about the priceless return you'll get later. Regular exercise is critical for a long and healthy life. Reap the benefits and enjoy the journey.